We are starting a new series here at the 10 Minute Jazz Lesson. It’s called Tune of the Month! 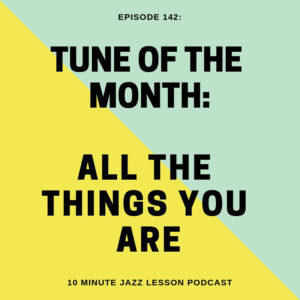 Every month we will be taking a look at an important jazz standard and coming up with a great exercise to get you improvising fluently over it. For our first month, we take a look at the classic standard, All The Things You Are. We talk about how the chord structure revolves around the circle of 4ths and how we can use this to our advantage with an exercise built off of chord tones and extensions. I also throw in a cool etude for Patreon subscribers just for the fun of it!